but that was when TLJ started filming so it's not really the same. Fits in with what Iger said. if it really is going to be a year long marketing campaign, then we should get something within the next 2 months. Honestly, it makes sense that they might start earlier this time around as it's the final chapter to a 40 years saga. I for one don't think we'll be getting a title, let alone a trailer, anytime soon. TFA was the first SW saga film in 10 years, it needed a buildup, and they had already finished filming. Avengers 4 has also finished filming, it comes out in under 6 months, and we don't even know what the title is yet. 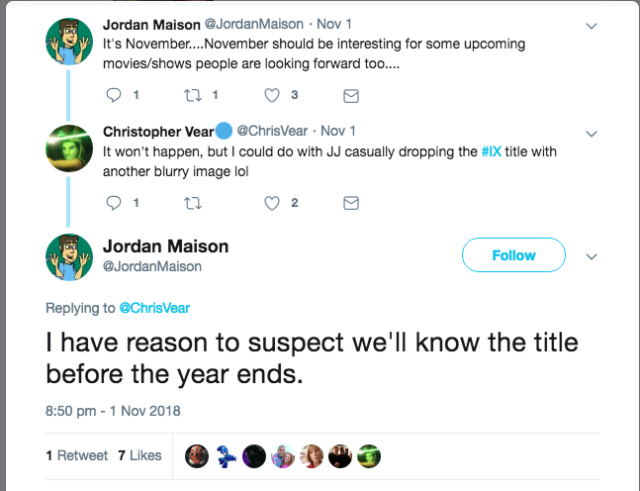 IX should have a longer buildup than that because of Celebration 8 months out from the film itself. But they aren't expected to even finish shooting until January/February. I think Disney wants to focus on their two holiday season films this year, then Captain Marvel and Avengers/the end of the 11-year, 22-film MCU story arc next year, before they push SW.
Too early for such a trailer. Shouldn't expect one until Celebration. I do expect a title relatively soon. -the film reveals that he has romantic feelings for Rey, there is no ambiguity like in episodes 7 and 8: after the movie, everyone will say "Ok, there was really something romantic between the two"
Who stole my Christmas wish-list? Guys, it's been a while! This is one of the best "leaks" I've read these months As for Mike Zeroh....I confess I often check his channel because this is an easy way to hear about reddit and 4chan "leaks", but I don't like his tone (+ the idea of giving him $$$ LOL). In fact, I started to catch some negative stuff he constantly repeats, many times referred to The Last Jedi and Rian Johnson, pretty tiring; "I want to see a more intimidating Kylo Ren", about Reylo "many people don't like it blabla" or insinuating Finn or Poe could be a better romantic choice (than Kylo). -I do love this thread . Lol yes, as soon as they mention “talking to Adam” or answer way too many questions, we kinda know then its FAF! I wish the Adam+Daisy parts are true tho! Oh I wish all the Adam & Daisy scenes were true though! But yeah, most likely fake. he has no inside knowledge but just crafted a leak based on various reliable leaks (MSW, those 2 reddit leaks from Jordan), interviews, tabloid report (grumpy Mark), actor's social media accounts revealing their locations, and the old 4chan leak. His instincts may be good and some things may turn close to what's in the movie, but he has no inside knowledge. take that to the bank. Ok so: I did one other scene afterwards that I feel would be too spoilery and perhaps give me away and cost me hundreds of thousands. Funny how we heard nothing about Rey with the lightsaber until that Jordan leak. Now all leakers mention lightsaber. Hmmm. Also, this guy is pretending that he hasn't seen The Sun photo leak even though all descriptions he gave are from the that leak and some stuff from MSW. A Public Service Announcement from the ladies of Six Degrees of Kylo Ren. We're in the business of closing gates, not doors. Today's PSA tackles a recent Reddit report. @Riri wrote: More from reddit! If I remember correctly, there was very early leak on 4chan about building underground tunnels/labyrinth for Trixie. Reminds me the description of these scenes. Sadly i can't found that leak. 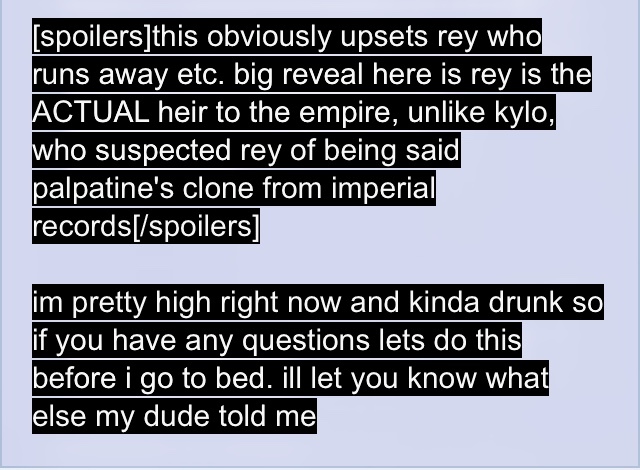 Also they answered a question about Kylo and Rey with the image. "Han and Chewie reclaimed the Falcon, but Han died shortly after getting to see his beloved ship again. Chewie and the scavenger Rey – who’d stolen the Falcon from Unkar Plutt on Jakku – then piloted the freighter into the Unknown Regions on a quest to find Luke Skywalker. After Rey left Ahch-To, the Falcon – now home to nests of porgs – served as an escape craft for the besieged Resistance on Crait." No mention how Han died...only that he died, which I find fascinating! Causes me to wonder if 1) Harrison Ford will have a cameo in IX, in a World Between Worlds concept. Han and Ben have a bonding, loving discussion about going back in time...changing what he did as Kylo...and Han refuses..that it had to happen....circle of life type concept because the entry mentions the nests of porgs...death and rebirth. Ben is not mentioned at all in the entry (or Kylo for that matter), which causes me to wonder if 2) He will pilot and/or co-pilot the MF in IX. @SW_Heroine_Journey To me it seems like Kylo killing Han is not relevant to the entry about the Millennium Falcon, and that's why it's not mentioned. @rawpowah wrote: @SW_Heroine_Journey To me it seems like Kylo killing Han is not relevant to the entry about the Millennium Falcon, and that's why it's not mentioned. I could see something like this happening with the world between worlds - am kind of obsessed about it to be honest I know but I really think they could be gearing up to go down this route with all the references we’ve had in the books, animations and comics. Billie Lourd did say a few days ago that episode ix was magical - what’s more magical and awe inspiring than the world between worlds and all it’s interstellar like implications ( if you’ve seen interstellar you’ll know what I mean ) as well as magical parallels to the Narnia chronicles- the magician’s nephew . I’ve often thought what you’ve just said was possible because of a couple of things - we didn’t actually see What happened to Han when he dropped down the shaft from the bridge into oblivion and also this would make a nice parallel with the scene in Rebels when Ezra tries to save Kanan in the world between worlds but realises he can’t - that if he did they would all die - and it is heartbreaking. 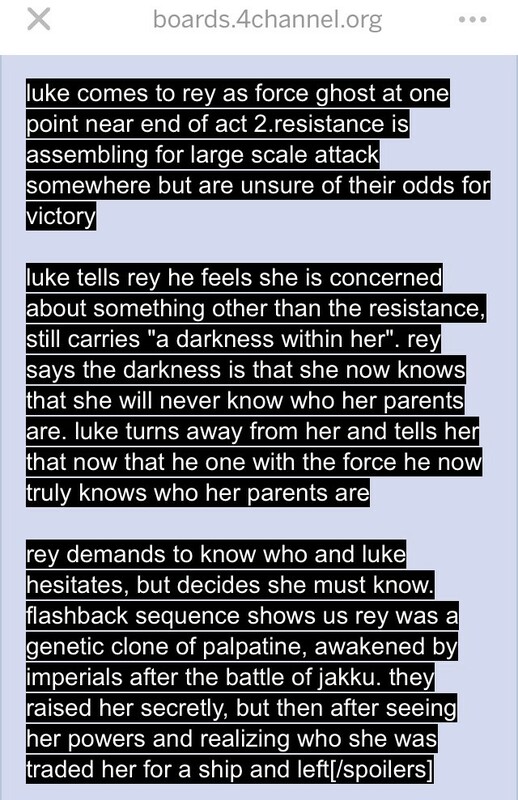 I could definitely see something like this playing out with Han but Han choosing to die because without him dying his son’s redemption doesn’t begin and also maybe Han is dying anyway ( not saying he is but wouldn’t it be ironic if Han was suffering from something like bloodburn- the disease pilots get in Star Wars if they spend too long in space - Luke killed by his devotion to the force and Han killed by his devotion to being best pilot in the galaxy ). All speculation of course but will be interesting to see what happens. There are so many options for Solo: A Star Wars Story (book, comic), and LF selected it to be one of their theatrical releases - the top tier for canon. Indeed, I may be wrong, but I feel the reason why is to emphasize the importance - bonds and symbolism of Han and the Falcon, and especially how they support the story of IX, especially Ben. Which is why I am focused on the wording of this entry for the Falcon. Hello everyone , have got two “ leaks” for you - one is from 4 chan and another one on Reddit - both appeared in last 24 hrs . Enjoy! lol! 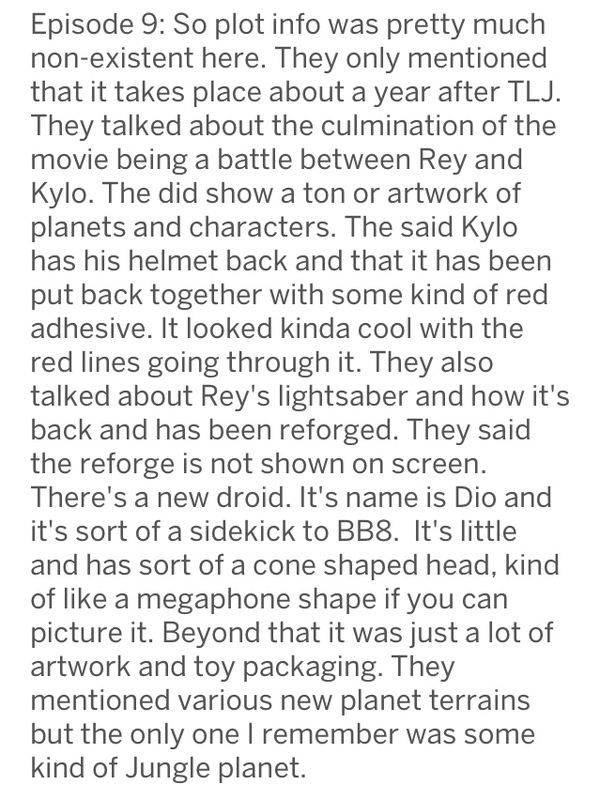 I'm not sure which one I dislike most; Kylo with a helmet again or Rey being the clone of a previous male character to explain why she is important.